The ceremonial opening of the Winter Town by KMPO took place at the Motorostroiteli Square. The Winter Town with a New Year tree, ice slides, and swing sets was first built on the initiative of the company's Director General Damir Karimullin in 2015. From then on, its ceremonial opening took place, which traditionally gathers a lot of people. 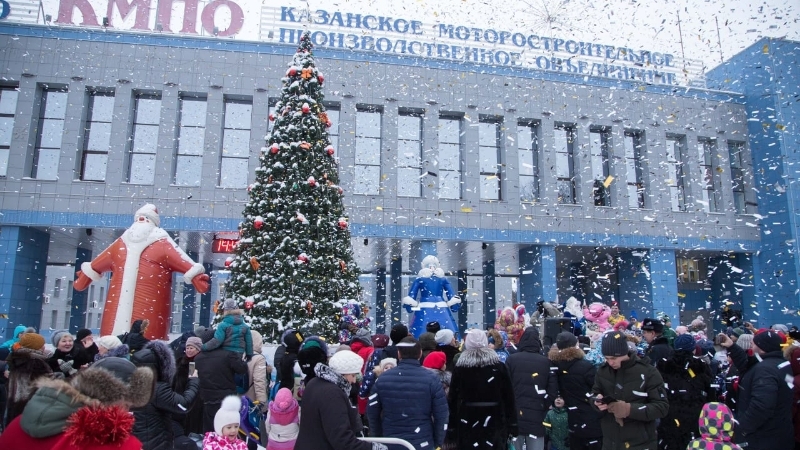 Both the factory workers with their children and residents and guests of the Aviastroitelny District come to feel the New Year’s atmosphere. The opening ceremony included songs, dances, competitions, gifts, and sports contests. Pony rides, downhill sledging, life-size puppets, New Year's surprises, a meeting with Grandfather Frost and Snow Maiden did not leave indifferent either kids or adults, giving everyone a vivid emotion and good mood. After the New Year holidays, the KMPO’s Winter Town will continue its work, and everyone will be able to slide down the hills during the winter.